July is usually the hottest month of year, since it corresponds with the peak of summer in the Northern Hemisphere. But July this year was 1.51 degrees above the long-term average. Most of the planet was warmer than normal in July. Parts of the Arctic were more than 7 degrees above average. The Middle East was particularly scorching. The city of Mitribah in Kuwait recorded a temperature of 129.2 degrees, which is the hottest temperature ever recorded in the Eastern Hemisphere. The record global warmth is definitely connected to extreme weather events happening around the world such as floods in Maryland, China, and more recently, Louisiana. These events are giving us an all-too graphic picture of what a future world might look like as temperatures continue to rise. 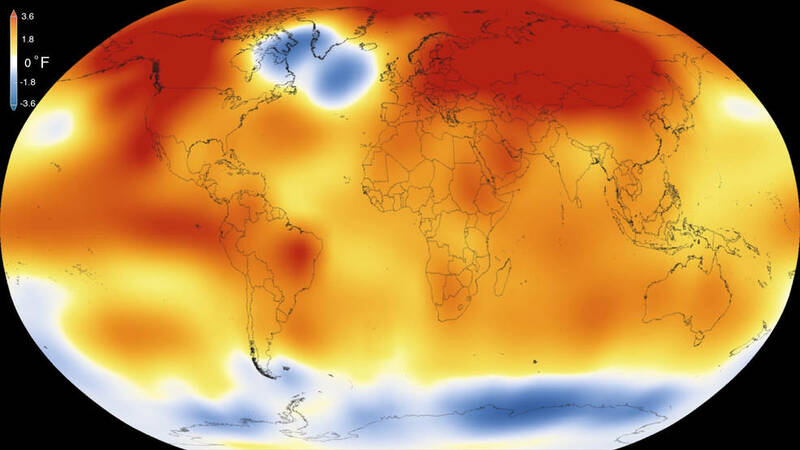 Fourteen of the 15 hottest years on record have occurred since the start of the 21st century. According to NASA, there is a 99% chance that 2016 will become the hottest year on record, surpassing 2015 and 2014. The planet’s temperature has steadily risen in recent decades as heat-trapping gases have accumulated in the atmosphere. The recent strong El Niño event contributed to this year’s spiking temperatures, but this year’s records have crushed the records set in previous El Niños. There are still people denying the mounting evidence of climate change and trying to blame the concerns on some political agenda, but the facts are speaking ever more loudly for themselves. Photo, posted January 20, 2016, courtesy of the NASA Goddard Space Flight Center via Flickr. ‘The Hottest Month (Again)’ from Earth Wise is a production of WAMC Northeast Public Radio.